Night 2 of Track Cycling will see the opportunity for more gold, with four on offer in a variety of events in which Australia should be extremely competitive once again. Join The Roar for a live blog of all the events starting from 7pm AEST. Up first tonight are the heats of the Men’s Keirin. The medal race for this event will be the final one of the night. The Keirin sees six riders per race go up against each other. Once the race starts, there are three laps of the velodrome completed, with the winner being first past the post. Australia’s Matthew Glatzer, New Zealand’s Edward Dawkins, 2017 world champion, Malaysia’s Azizulhasni Awang and Scotland’s Callum Skinner will be the favourites in this event. The Women’s Sprint semi-finals and finals also will provide Australia with more medal opportunites, with the silver medalist from the 2018 World Champs, Stephanie Morton featuring alongside compatriot Kaarle McCulloch. After winning the team sprint last night I wouldn’t be surprised to see an Australia 1-2. Natasha Hansen should provide good competition for both Australians. The other two events on the schedule tonight are the individual pursuits. The women complete three kilometres, whereas the men complete four. In the Women ‘s event, Australia could fill all three spots on the podium, with former world champion Rebecca Wiasak, who wasn’t selected in the final Women’s TP squad that won gold last night, going up against compatriots Annette Edmondson and Ashlee Ankudinoff, who was second at the World Champ’s last year. However, Katie Archibald of Scotland, and Kirstie James of New Zealand will have other ideas. In the Men’s event, the 2017 World Champion Jordan Kerby goes in as favourite, with fellow Aussie Kelland O’Brien and Sam Welsford in with a shot also. From the British contingent, Charlie Tanfield was third at the World Champs this year, and should push the Australians. 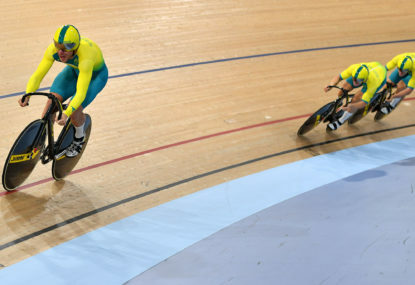 Join The Roar’s live coverage of Night 2 of Track Cycling from 7pm AEST.